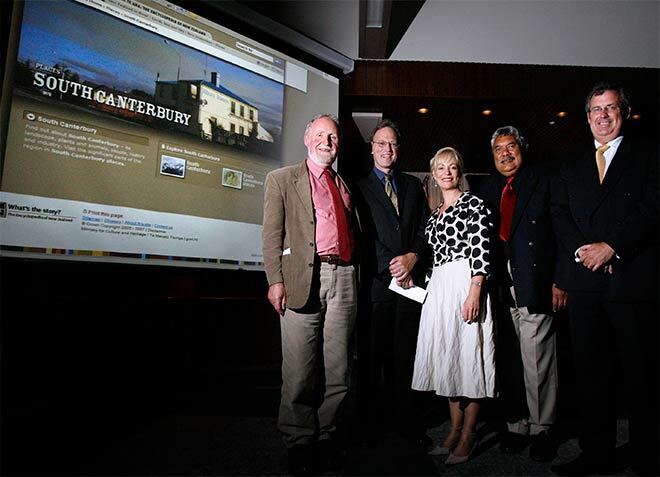 Shown at the Timaru launch of the 'South Canterbury' entry on 28 February 2007 are (from left) entry author John Wilson (whose story appears below), Te Ara general editor Jock Phillips, Timaru mayor Janie Annear, associate minister of arts, culture and heritage Mahara Okeroa, and Ministry for Culture and Heritage CEO Martin Matthews. Writing for Te Ara as the first entries were being posted gave me an opportunity to use a relatively unusual combination of skills. After an academic training as a historian, I pursued a career as a journalist. As a historian, I was able to meet Te Ara’s exacting standards of accuracy; as a journalist I was practised in writing for a popular rather than an academic audience. But a greater satisfaction than work that matched my skills was that the year I wrote for Te Ara was a year of personal exploration. When I was writing the entry about the Scots in New Zealand, I remembered my Scottish-born grandparents and Presbyterian upbringing. For the entry about Latin Americans in New Zealand, I contacted Chilean refugees my mother had helped resettle in the 1970s. Writing about mountaineering, I relived my youthful exploits in the Southern Alps. I wrote, too, the regional entries about South Canterbury – where I had been born and lived the first seven years of my life – and Canterbury ‘proper’, where I had spent the rest of my childhood and most of my adult years. It was my attachment to Canterbury that cut short my time with Te Ara. I enjoyed the attractions of Wellington while I was writing for Te Ara. But after a year I retreated to Christchurch, in plenty of time for the earthquakes. Following them I retreated again, into the mountains. There I found it feasible to continue a life of research and writing only because websites like Te Ara put information instantly on screen. It is a happy situation that the site I helped in a small way to develop helped me, after I decided to leave a city which no longer had much heritage left, and continue a career as a writer.